Just when you thought the controversial notch couldn’t get uglier, here’s Samsung taking everyone by surprise with a design that nobody could see coming. The device you see here is Samsung’s very own 5G demo phone which was presented at the Snapdragon Summit in Hawaii and supposed to show how the South Korean firm wants to bring 5G to its devices. The smartphone features a notch, but not exactly where you expected it to be, but in the top right corner. 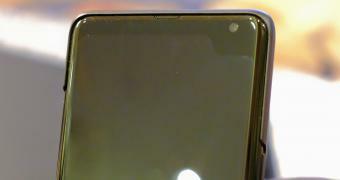 By the looks of things, the notch is the home of the front-facing camera, while the speaker is placed right on the edge at the top of the phone. While this is a horrible approach, there are several things that need to be mentioned here.